The most powerful set-top box is on its way, bringing 4K Ultra HD performance to your home and a full suite of gaming goodies. The daddy of set-top boxes, the Nvidia SHIELD, is coming to these shores with availability starting from October 1,as the saying goes, in all good shops. The SHIELD is the most powerful set-top box around, running natively at 4K Ultra HD resolutions and able to output 4K UHD streamed content from the likes of Netflix as well as having the power to run high bitrate vids on the box itself. 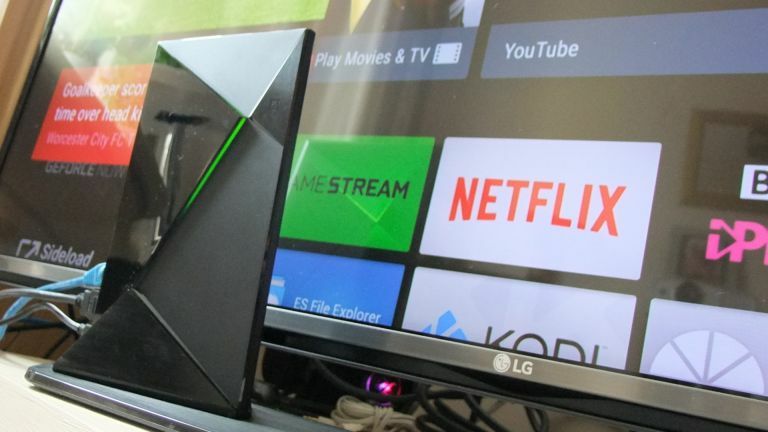 Running the burgeoning Android TV operating system the new SHIELD box has access to all the goodies the latest TVs from Sony and Philips are offering, such as Netflix and Amazon Prime Instant Video, as well as all the content from the Android TV Store. Which sadly isn't as much as you get from the standard Play Store, but it is improving. Slowly. Though you can sideload app easily, but they won't appear on the content-rich home screen. And because it's from Nvidia and part of the whole SHIELD ecosystem, it's also got some serious gaming chops too - way ahead of whatever Apple and Amazon want to call gaming on their respective boxes. It's over twice as powerful as the new Apple TV and almost five times quicker than the new Fire TV box. As well as being able to play standard Android games, the SHIELD and its super-powerful Tegra X1 processor are also able to offer games specifically optimised to run natively on the hardware. Full PC games like Half-Life 2 (including Episode 1 and Episode 2) are available as are the Portal games and the excellent This War of Mine and Trine 2. The integrated 256 core Maxwell GPU is the same basic design as the latest graphics architecture used in the most powerful PC graphics cards of today, the GeForce GTX 980 Ti. You can also stream directly from your own gaming PC to allow you to play PC games via the SHIELD on your living room TV. And even if you don't have a gaming PC capable of streaming the latest next-gen titles you can always get involved with the newly available GeForce NOW streaming service. This is being touted by Nvidia as the Netflix of games, offering unlimited 1080p/60fps streaming of some of the biggest PC titles for a monthly fee of £7.49/month. For us one of the most tantalising prospects of the new SHIELD device is its 4K Ultra HD performance. It's incredibly powerful, able to play 4K content at 60Hz, with a native, slick-running 4K interface. The Amazon Fire TV, while sporting some 4K prowess, can only manage 30Hz with its more limited hardware. You might wonder what the point is in a 4K set-top box that needs a HDMI 2.0 (and HDCP 2.2) connection to your TV, when high-end 4K TVs with such inputs are likely to have their own smarts and 4K Netflix apps. But the fact is that there are going to be a host of new, affordable 4K TVs arriving this autumn (beware Black Friday…) which are sporting high-resolution panels, and the advanced inputs, but no smart capabilities of their own. It's also a stunning general media player too - you'll struggle to find content that it can't play. With Plex pre-installed and easy access to the might of the Kodi platform, you'll be able to get all your media playback needs catered for with this sleek little box. And with Android TV still lacking things like Spotify and Tidal it's a good job that Nvidia has included casting with the box. The SHIELD is Cast-enabled so you can fling content from any device at the box and it will appear on-screen, you can even just plain mirror your Android device, linking up beautifully with the SHIELD Tablet. And at just £149 for the standard Nvidia SHIELD, that's a smart play. With such a powerful processor inside it the SHIELD will be able to keep up with the advances and demands of future 4K content. Something today's smart TVs might not be able to do. The 16GB Nvidia SHIELD goes on sale tomorrow for £149 with the 500GB SHIELD Pro will be retailing for £229. The basic spec comes with the controller, but unfortunately the remote and super-sticky, ultra-stable stand (seriously, this thing just won't budge) are optional extras at £40 and £25 respectively. Look out for our review of the new SHIELD tomorrow, when Nvidia let us loose. Suffice to say it's an impressively powerful device, and definitely the most powerful set-top box around. The 4K set-top box is mighty powerful, but is being sadly hampered by an Android TV OS which still feels half-baked.